Power Up's on the Moon? As we all know by now, the next map is based on The Moon, but I've noticed a few strange occurrences and have a theory for them. Let's start off at the earliest point I've noticed this, in Der Reise, there is an Easter Egg named 'the fly trap' where if you shoot a hidden switch with a PaP'ed weapon a number of power ups are generated and spin in a circle and fly off into the sky. Picture of the fly trap being activated. With some very interesting reads on this website, I discovered that Der Reise may have been used to create Nazi UFO's before the Element 115 project and the place the powerups that fly away spawn in was supposedly used to house one of the UFO's. Moving away from Der Reise, our next stop is Ascension. My theory for the reason they travelled to Ascension was to hijack the rocket to get to the moon where Richtofen wants to go, when this failed heis only other method was to recover the golden rod and focusing stone to use its powers to teleport there as the Vrill Device can teleport you to different realms. But anyway, if you notice in Ascension when the rocket takes off, headed for the moon to the base there, if you shoot it down, it drops a double points powerup, meaning these power ups were present in the ship, being transported to the moon. And now finally, we go to Shangri-La, in Shangri-La, if you pick up a powerup before a monkey can steal it, it will hit you and run back to the main temple. After climbing up the stairs and falling into the temple there will be a short pause before a rocket will take off from behind the temple and go into space! My theory is that the monkeys have been collecting powerups and then when it realised someone else was there using them it decided to flee with the ones it already had back to its base, which is on the moon! So the powerups from the flytrap headed to the moon, the ones in Ascension were meant for the moon and the ones in Shangri-La were being taken to the moon by the monkeys which in Ascension were sent down FROM the moon! Again, this is only a theory, and may not be correct, but please feel free to comment below any opinions you may have, thank you ! Well there's just one problem, they don't take the power ups there. If you take the power up and they hit you and run back, then the rocket launches. Yeah but they're the same monkeys sent down in Ascension minus the suits, when the rocket launches they must be returning somewhere. Yeah it's a good theory about taking them to the moon however in der riese, I'm not sure that the power-ups from the fly trap are taken to the moon. It's been a while since I've played but if I remember rightly the power ups elevate and then fly off towards the catwalk side of the map, whereas the moon is above the mainframe at the start? Yeah I thought that myself but maybe their taken to a different location on Earth? 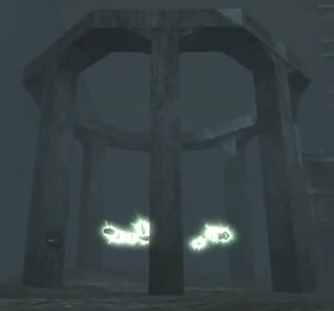 The place where the powerups spawn is supposed to hold a Nazi UFO but where is it? Maybe they went to join it wherever it is.